Airport’s unaudited condensed interim statement for the 3-month period ending 31 March 2018 shows that Riga International Airport has closed the 1st quarter of 2018 with a turnover growth of 15%. Compared to 2017, Airport's net turnover has increased by 15% or 1.7 million euros, reaching 13 147 054 million euros. The Airport has closed the first quarter of 2018 with a profit of 2.2 million euros. Revenue from aviation services in the reporting period amounted to 8 million euros, and it is an increase of 1.5% as compared to the previous year. The largest share of aviation revenue consists of income from the services, the charges of which are set by the laws and regulations governing charges of aerodrome services and charges of security and rescue measures at the aerodrome. In the reporting period, income from non-aviation services amounted to 5.1 million euros, and it is an increase of 2% as compared to the corresponding period of 2017. The main non-aviation services offered by the Airport include lease of premises and land, and other services. In 2017, the Airport's net turnover was over 54.6 million euros, which is a growth of 8.3% or 4.2 million euros, as compared to 2016 (data of the company's annual report for 2017). Revenue from aviation services in 2017 amounted to EUR 31.4 million, and it is an increase of 2 696 883 euros or 9.4% as compared to the previous year. Income from non-aviation services amounted to 23.2 million euros in the reporting period (an increase of 6.9% or 1 495 265 euros). The Airport's 2017 operating profit before financial items is EUR 3 078 431, and the year 2017 has been closed with a profit of 3 486 688 euros. The profit of the reporting year was significantly influenced by the new corporate income tax regulation (as a result of a tax reform), recognizing a reduction of deferred tax liabilities of 2 480 143 euros in the income of 2017. 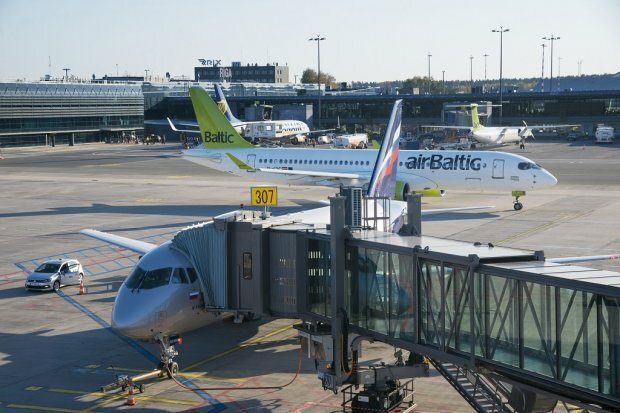 As reported before, in the first quarter of the year Riga International Airport handled nearly 1.4 million passengers; the passenger traffic at Riga Airport, as compared to the corresponding period of the previous year, increased by 19.4%, reaching 1 352 776 passengers. This summer season 100 destinations are available to passengers travelling from Riga Airport. A total of 18 passenger carriers operate flights from Riga Airport: airBaltic, Ryanair, WizzAir, Aeroflot, SAS, Finnair, Norwegian Air Shuttle, Lufthansa, LOT Polish Airlines, Utair, Turkish Airlines, Ukraine International Airlines, Uzbekistan Airways, Belavia, Ellinair, Primera Air, and Smartlynx Airlines. Riga International Airport is the largest air traffic hub in the Baltics, and one of the fastest-growing airports in Europe. The 19 airlines operating at Riga Airport offer nearly 80 destinations in the winter season and 100 in the summer season. In 2017, Riga Airport handled over 6 million passengers - 45% of the entire Baltic air passenger traffic.